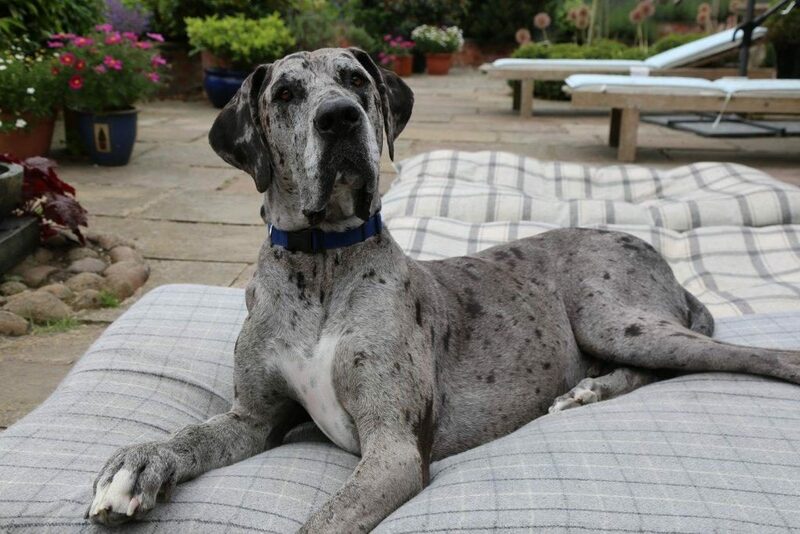 Gentle giant Sweeney, a Great Dane with a big personality is brought in by Sally after being diagnosed with a cancerous tumour in his leg. Sally is hoping Noel can perform a unique procedure; replacing bone with metal to avoid amputation and restore full function. It’s a high-risk operation with no guarantees of success and both Noel and Sally face an anxious wait post-surgery to find out if the cancer has spread. Sweeney was referred to Fitzpatrick Referrals after his primary care vet suspected an aggressive bone cancer, most likely an osteosarcoma. 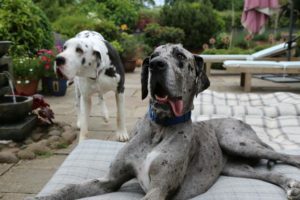 His family, Sally and Colin, had been offered full limb amputation elsewhere, but were keen for Sweeney to be seen at Fitzpatrick Referrals where limb salvage is offered as an option for some dogs with bone cancer as an alternative to amputation. Sweeney’s cancer diagnosis came as a huge blow to Sally and Colin, they wanted to give him the best possible life, for however long they had with him, even if it was only six to eight months. Having spoken with Noel at length, his family decided on the limb-sparing surgery to remove the diseased bone in his leg and replace it with a specialised implant that Noel developed, called an endoprosthesis. Removing the diseased bone should help slow the spread of disease to other parts of Sweeney’s body and also remove the intense pain associated with the tumour. Noel performs this operation on average twenty times a year. The objective is to remove the entire section of diseased, cancerous bone plus additional margins in an attempt to ensure it’s entirely removed and replace it with metal. The operation to remove Sweeney’s tumour would be challenging as it had grown through his bone and into the surrounding tissue meaning that removing it entirely, whilst leaving enough soft tissue and vessels to continue supporting the leg once the metal was placed, would be a significant challenge. If every last tiny tumour cell was not removed then the tumour could potentially recur locally over time. Noel made a long surgical incision down the length of Sweeney’s forelimb to expose the entire radius, ulna and carpus and metacarpals whilst preserving as much soft tissue as possible. With the bones exposed Noel was able to see the huge tumour and immediately set to work removing it. With the tumour removed, Noel then used a cutting edge technique called photo dynamic therapy as an attempt to kill any remaining cancer cells in the area. The final stage of the operation was to fit Sweeney’s giant metal implant to bridge the gap between the two sections of bone in his leg. After three hours, the surgery was complete. Sweeney would need to remain at the practice for close observation to ensure no complications arose whilst his leg healed. With good luck and healing, Sweeney should be able to walk without support within a week, but it would be at least eight weeks before his leg would completely heal. Two weeks later Noel was happy with Sweeney’s progress and Sally and Colin were able to make the 200 mile trip from York to collect him and take him home to continue his recovery. Sweeney needed an intensive course of chemotherapy to try to keep the cancer at bay, but Sally and Colin knew that there are no guarantees, and even after the surgery and chemotherapy, his cancer could one day return. Four months after his surgery, Sweeney and Sally returned to Fitzpatrick Referrals for a re-check with Noel. However, during examination, Sally and Noel noticed that there was a swelling around his implant, and Noel requested urgent scans to investigate. In spite of the best efforts of Noel and the team, the devastating news was plain to see; the tumour had grown back around the implant and, even worse than that, it had spread to his lungs as well. The main thing for his family was to know that he was not suffering. Heartbreakingly there was nothing more the team could do, and so Sweeney was started on palliative care to give him as much comfort and happiness for as long as possible. His family had always known that the cancer could come back one day, but they wanted to explore every avenue and were grateful they did because it gave Sweeney more time in comfort, able to enjoy life on four legs and it gave Sally and Colin more time with their beloved best friend. Thanks to the love of his family and commitment of the team Sweeney had six extra months of a good, happy quality of life. We miss him terribly, but are thankful for having known and loved this gentle giant.